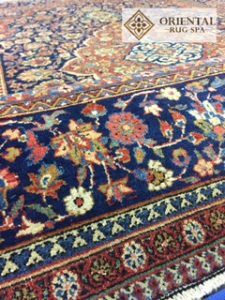 Oriental Rug Spa offer a specialist Persian, Oriental and Contemporary rug cleaning in Pirbright. We also offer a rug repair service. If you own a dirty or soiled rug that needs professional cleaning, then why not give us a call on 01276 423150. You can drop the rug into our wash facility or arrange a time for us to collect from you. Kashan rugs are considered amongst the best in the world. They can be woven with a wool or silk pile, sometimes with a combination of both. Kashan is a city situated in central Iran and is also well known for its architecture and historical monuments. Antique Kashan rugs are in high demand by collectors and dealers, and therefore high purchase prices can be expected. The design usually consists of a central medallion, but all-over floral and animal designs are not uncommon. One of the most famous Kashan rugs (The Ardebil Carpet) can be seen in the Victoria and Albert Museum in London. The rug measures an enormous 34 ft x 17ft. There is another Ardebil carpet in the County Museum in Los Angeles.